To summarise, the Wood family line previously consisted, in order, of two named Richard, followed by three named Francis, all living in Yorkshire, and then a third Richard who moved from Yorkshire to London. His son Richard (4) was born in London but moved to Melton, and then Richard (4)'s son Richard (5) was born on Friday 13 Feb 1756 in Melton. He followed the family tradition, joining his father as a lawyer in the Woodbridge firm but died from smallpox at the age of 30 on 17 Nov 1786 in Hasketon. In consequence his surviving brother, John, youngest of the family eventually took over the family firm. It is possible that Richard (5) was the one married to a Hannah Fellgate at St Matthew, Ipswich on 31 Dec 1776 [Batch No: M012772] but of course the name Wood is very common. The full known details of Richard Wood (3) and family can be found on the previous page. As can be seen from the dates above Richard Wood (4), the next head of the family - and the family firm - was only 9 years old when his father died. His mother, Mary [Seedall] Wood, born in Preston about 1805, died only a few years later than her husband, on 31st July 1741, aged 36, leaving children Sarah 15, Richard 14, Mary 12 and Robert 6. Mary [Seedall] had a sister Ann [Seedall] who was married to an Arthur Dobney and living in Islington. Reports appeared in the London Gazette in 1723 when 'Arthur Dobney of the Parish of St James Clerkenwell in the County of Middlesex, victualler' had evidently filed for banruptcy. He was accordingly examined on 29 Oct 1723 and was granted his request on 19 Nov 1723. No more is heard of him until his death in Islington on 6 Dec 1744. Ann, his wife, died many years later, on 15 Mar 1760, by which time only her nephew Richard, then 33, married and living in Melton and niece Mary, now aged 31 and married to a William Smith, were still surviving. Ann, had made a Will in 1758 and probate was granted on 1 Aug 1760. This gives some fascinating new information - and as usual poses some new areas for research! 'I Ann Dobney of the Parish of Saint James Clerkenwell in the County of Middlesex, widow, being infirm in Body but of a sound and disposing mind and understanding do make and declare this my last Will and Testament...' and so on. Ann Dobney's first bequest is to 'my brother Henry Seedall' to whom she left ten pounds. This is the first mention of Henry about whom nothing else is yet known. Ann's next bequest is to 'my Niece Jane Wood daughter of my Nephew Richard Wood of Melton in the County of Suffolk Gent', that is, Jane Wood, eldest child of Richard Wood and Mary Searles who later married Thomas Whimper of Glevering Hall, but who was only 4 years old in 1858. She also received ten pounds, but there is no mention of Richard (5) then aged two. (By then there had been one other son, Robert, but he had died the previous year as a baby.) Jane was of course actually Ann's great-niece. The third bequest was to Ann's own son - another 'new' person - Richard Smith. This of course raises the question of an earlier marriage between Ann Seedall and someone named Smith, though with that surname it will prove difficult to trace. (No Seedall/Smith marriage has been found yet). Richard received just one shilling which seems a rather nominal sum, presumably because he inherited the rest of Ann's goods and chattels.It is impossible to value this as he also inherited any debts, including the funeral expenses. Lastly 'my Niece Mary the wife of William Smith,' received 'the same and every Part thereof' as Richard. This Mary must be the daughter of Richard Wood and her sister Mary [Seedall] Wood. She married William Smith on 15 Jul 1756 at St Margaret Lothbury in London.Whether William was related to Richard Smith is not known as Ann Dobney gives no further information. The two sisters Mary and Ann perhaps also had brothers - a William Seedall is recorded dying in Islington on 25 February 1758 (aged 69), but this could simply be coincidental. Some adult must have cared for the children during the 1740s, perhaps Ann Dobney, but there could be other as yet unknown guardians. Somehow Richard(4) was able to train as a lawyer like his father and had moved to Melton by 1752 when he married Mary Searles in the old St Andrew's Church in Melton, Suffolk. 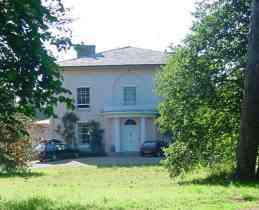 If his father had not acquired Melton Hall by this time then it was Richard (4) himself who did. It does suggest that by the age of 25 he was either doing very well on his own account and/or had been left a handsome inheritance. This gap of 11 years leaves many interesting questions as yet unanswered, about the actual move, the founding of the family firm in Woodbridge and more about the origins of the Searles family. The Melton parish records are available on microfiche in Ipswich Record Office but new details here are mostly from the family bible. For invaluable photocopies and other information many thanks to a descendant of the Wood family. There were several important changes in the law during the lifetime of Richard (3) though they would have affected his son and grandson, Richard Wood (4) and (5) in Melton, rather than him personally. From 1728 a solicitor had to study articles for five years with a qualified solicitor. It is not known who Richard Wood (4) turned to for this purpose. From 1749 solicitors had to swear affidavits 'of due execution'. It would be useful to consult these from this period on as the registers note the name of the solicitor to whom the clerk was articled. Some of those suriviving also note the names of the candidate's parents. [PRO Records Information Leaflet 112 lists the different courts' records.] Local law societies were founded in the late 18th century but the Law Society was founded in 1831. Richard Wood (4), born in London in 1727 moved to Suffolk where he founded the family firm of solicitors in Woodbridge which lasted for nearly 200 years before closing as 'Wood and Barham' in the 20th century. He married Jane Searles in St Andrew's, Melton, the old parish church, on 16 Oct 1752 'by License'. It is this 4th Richard in the direct line who was the senior partner of the firm known then as 'Richard Wood & Son, solicitors' along with his eldest son, also called Richard, as the junior partner, referred to as Richard (5) above, who predeceased his father by 20 years. After his death in 1786 the '& Son' refers to John Wood, Richard junior's younger brother, youngest of the children of Richard (4) and Jane Searles. The family tree originally drawn to show the frequency of the name 'Searles' as a first name when nothing was known about Jane Searles, also shows the main characters in this portion of the Wood family and the use of family surnames as middle names, but not in order of seniority. Richard (5), older than John of course, is one of the '4 others', all shown in the complete list. The old church of St Andrew in Melton had been left behind by the village which expanded in the direction of Woodbridge. It had also become far too small for the congregation so a new church was built in the mid-19th century and the font transferred there. This was however the one attended by the families listed below. It was thanks to the kind assistance of the churchwarden that we were able to visit the new church, also dedicated to St Andrew,and to view the memorials to the members of the Wood family who fought and were killed in WW1..The War Memorial is on the right above. Ipswich, March 29. 1781 On Friday last (Mar 23rd) an inquest was taken by R. WOOD, Gent., at Marlesford, on the body of Richard COOPER, who hanged himself with a bed-line, in an out-house; the jury brought in their verdict: Lunacy. closely followed by 18 Aug 1781. Richard appears in these pages as 'R.Wood, gent.' on Tuesday 14 Aug 1781 in Ipswich at the inquest on the suicide of a John Cables, master of the White Hart in Saxmundham, but which Richard, father or son, is not clear at present. It was probably Richard Wood (4) who bought Melton Hall. A 17th century house, it had several acres of land. Perhaps the pattern of home life was set then as described in the journals of his youngest son, John, and John's family in the 19th century, when normal home life might be interrupted with letters to be answered, 'and neighbours who called for dinner or tea might take the opportunity to discuss some matter of business.' In 1781, when Richard (5) was still alive, the two Richards, partners in the firm, may still have had had business in London. This was certainly true later with John and his son, who used their own carriage to deal with business in London or in Norwich, 'staying overnight in Chelmsford or Romford, but sometimes they travelled by the coaches which left daily from Woodbridge to London'. Cousins, descendants of John's branch of the family, were still living here in 1915. Note - Godparents named Syer or Jeaffreson are identified on the Searles family page, others in italics below if known. 2. Richard Wood junior was "Born at Woodbridge on Friday the 13th February 1756 about 8 o'clock in the Evening. Baptized on the 14th by the Rev. Mr John Clarke.". 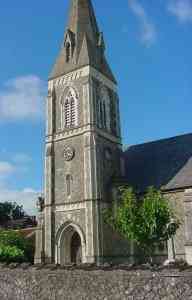 "The above Jane & Richard Received into the Church, Woodbridge, on Friday the 9th Day of April 1756 by the Rev. Mr Thomas Ray. The Godfathers were Mr Edward Highmoor & Mr John Syer, the Godmothers Mrs Ann Lambert & Mrs Mary Syer." Mrs Ann Lambert was the wife of the Vicar of Melton, Mr Edward Highmoor is at present unknown. 1. Jane Wood The family bible gives the details of Jane's marriage to Thomas Whimper of Glevering Hall, Hacheston on 24 Oct 1776 in Melton by Thomas Lambert, Rector of Melton. Both signed and the witnesses, who also signed were Richard Wood, Jane's father, and the Rev. Christopher Jeaffreson. The family Bible also mentions as present Jane's brother Richard, her sister Mary, and Miss Isabella Jeaffreson. Jane and Thomas had a daughter Mary Whimper who was baptised in Melton old church on 6 Apr 1780 and one son Nathaniel. Nathaniel had a son Josiah born in 1812. 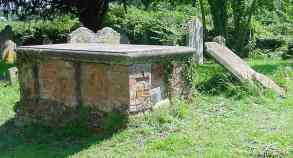 Jane died on 25 Apr 1814 and was buried in the family vault with her parents. 2. "Richard Wood junior, gent. of Melton", as named in 1785, along with his father, in a Letter of Attorney by the heirs of Robert Oneby appointing them to take possession of Oneby estates in Suffolk can now be identified as the eldest son of Richard (4). This document is now in Suffolk Record Office at Bury St Edmunds in the archives of the Barnardiston Family. Richard Wood junior didn't survive to be the senior partner but died of small pox on 5 Nov 1786 at Hasketon, aged 30 and was buried at Melton. He does not appear to have married. The bulk of the family papers, those pertaining to the business, the family journals and a large number of other less easily classified documents were passed on to Ipswich Record Office by the firm of Wood and Barham when it closed down in the 20th century and the summaries alone of these fill a foolscap sized ledger so no more than a fraction can be mentioned here. The firm is said to have been 'typical of this kind of small country solicitor', dealing with the management of the affairs of neighbours, the drawing up of wills, the conveyancing of parcels of land, and so on. A large proportion of these papers are those of the two John Woods, father and son, the elder being Richard junior's younger brother (see below). 3. Robert Wood "was born at Melton on Saturday the 9 Jul 1757 about 4 o'clock in the morning. Baptized the same day by The Revd Thos. Lambert. Died the 1 Oct 1757. Buried at Melton the 4th." 4. Mary Wood 'Born at Melton on Wednesday the 27th June 1759 abt 4 o'clock in the morning. Baptized the same day by The Revd Mr Thos. Lambert'. Mary married Joseph Oldham, grocer and draper of Melton, and bore him 14 children according to the parish register). 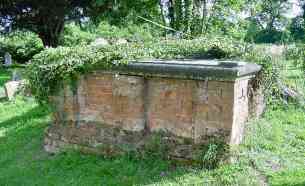 Joseph died on 26 Feb 1818 in Wickham Market, presumably while there on business, but is buried in Melton. Mary, who died ten years later, in 1828, is buried with him in the grave alongside the church wall beyond the vault.. This photo shows most of one of the rows of small stones mentioned above and part of the 2nd row. The Rev Thomas Lambert and his wife Anne figure frequently as godparents to the children of Richard and Jane. Their daughter Beliza married John Oldham and was almost certainly related to Joseph's family. The probability of Joseph and John being brothers is explored on the Oldham family page Part I with relevant details on both Oldham and Lambert families. 5. William Wood "Born at Melton on Monday the 14th June 1762 bet. 11 & 12 o'clock at Night. Baptized the 16th of the same Month by The Revd Mr Lambert"
"NB. 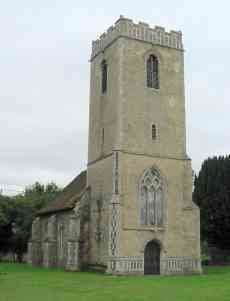 The above Mary & William Received into the Church at Melton on Thursday the 2d Dec. 1762 By the Revd Mr Lambert. The Godfathers were Mr John Syer & The Revd Mr Christ. Jeaffreson. The Godmothers Mrs Charlotte Lambert & Miss Mary Syer." ".....William Died the 14th Jan.1763. He was Buried at Melton the 17th"
6. Searles Wood "Born at Melton on Tuesday 1764 bet. 12 & 1 o'clock in the Morning. Baptized at Melton Church the 2d March 1764 By the Revd Mr Lambert. The Godfathers were Mr John Syer & Mr Robt Wade. Godmother Mrs Eliz. Wade Wife of ? * Robt." 'Searles Wood died at Sea the 26 Nov 1807 in his 44th Year, buried at Sea from on board the H.C. Ship Worcester of which he was Captain.' This voyage is marked in bold on the list above. [Madras, India, was site of the East India Company's first settlement; Mallacas is a region of Indonesia]. At the Old Bailey in 1799 (see below) Searles is referred to as 'Mr Searles Wood of Calcutta'. His home address appears at the time he made his will was proved in 1809 as 'Searles Wood of St Mary Lambeth'. .The East India Company was taken over by the British government. Presumably the Worcester was scrapped and replaced by even larger and faster vessels. Captains of these ships were said to be able to become very rich and Searles does not appear to be an exception! This is recorded by the IGI on 27 May 1806 at Old Church St Pancras, a real mystery since it appears that Searles and Mary were already married! The evidence for this is from a court case at the Old Bailey concerning the prosecution by Mrs Wood, 24, wife of Mr Searles Wood of Calcutta, of a personal maid, Esther Mason, aged 21 for pawning and stealing various items including clothing. The total amounted to less than 39s worth so Esther Mason was sentenced to be transported for seven years, presumably to Australia. (The penalty for stealing more than 39s was hanging!) Several details about Mary Catherine Rosina are revealed by this fascinating case which can be found in full - no legal jargon, it reads more like a play - on the Old Bailey website. Mary was born in Stockholm about 1775, being therefore eleven years younger than Searles and had lived in England for nine years. Her lawyer unsuccessfully tried to explain some legal term to her in French (her origins are claimed on a website for the Fagalde family be from a French family of that name noted for their chocolate-making, but there is no evidence of this) but perhaps her first language was Swedish. At the time of this court case she was living in lodgings and had access to as much money as she needed. All she had to do was to apply to the agent her husband had appointed for as much as she required. There did not appear to be a limit. Esther Mason had been dismissed from Mrs Wood's service and accused Mrs Wood of not paying her wages and of locking the door of her room so that she could not collect her clothes. Mrs Wood had been arrested, but only briefly as she promptly accused Esther of the thefts. The case was heard at the Old Bailey the following day. The evidence was confusing but the case was quite quickly concluded after Miss Aurelia O'Hara, friend of Mrs Wood and daughter of the Governor of Gibraltar vouched for her in court, though Miss O'Hara was very reluctant to appear at all until summoned by a sub-poena. Over the question of the Wood-Fagalde marriage there are several possibilities and yet more questions raised. At the Old Bailey trial Mary Catherine claimed to have been married in Gracechurch St, but no record of this has yet been found. Gracechurch St is the continuation north of Fish St, which at the time was the main thoroughfare leading down to the old London Bridge - and to Kent if not Surrey as well. (The main route into London turns west where the two roads meet) The church she meant must have been St Benet's, rebuilt by Sir Christopher Wren after the Fire of London, but tne IGI has no record of such a marriage there then. Mary had married Joseph Oldham who was possibly even the brother of John Oldham, Beliza's (deceased) husband. Since all marriages, except between Jews and Quakers, had to take place in the parish church, the only place licensed, one elsewhere would be invalid, being ignored as merely a 'blessing'. Serving soldiers needed the permission of their commanding officers to be married and perhaps there was a similar requirement for the East India Company, especially if their first marriage was before Searles became a Captain himself. Or there was some other irregularity - or even that she was claiming to be married when she wasn't. Searles was frequently away from home, from the time of being a midshipman till Captain of the Worcester about 1801. He was in England from Dec 1805 till Mar 1807. It doesn't look as though Searles and Mary had any children. 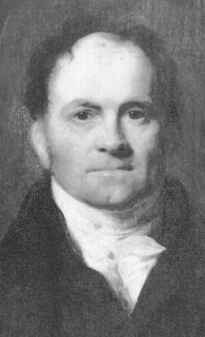 Searles died at sea, aged 45, on a voyage from India to the East Indies and his will was proved in London on 13 Feb 1809. 7. John Wood, "born at Melton the 19th February 1766 abt 3 o'Clock in the Morning. Baptized the 20th of the same month by The Rev Thoms. Lambert and Received into the Church at Melton on Tuesday the ?? Feb. 1771 by the sd Thos. Lambert. The Godfathers were Mr John Stow & Mr John Syer jun. The Godmother Miss Beliza Lambert." John joined his father in the legal business in Woodbridge, becoming head of the firm in 1806 when his father died. He is frequently referred to as John Wood senior as his eldest son, also called John, joined him later as junior partner in 1815. John senior married Mary Anne Baker, probably about 1796 and they had 13 children. The entry in the family Bible for Jane reads: "Jane, the Wife of Richd Wood late Jane Searles Died the 24th Aug 1791" She was buried at Melton 28th Aug.1791 in a Vault Richard had had erected in Melton churchyard. She was.65. The inscription as it was finally revealed read as follows: 'Sacred to the Memory of Jane Wood the wife of Richard Wood, Gent and the daughter of Richard Searles of this Parish who after a long Affliction died August 24th 1791 aged 65. Also to the Memory of the said Richard Wood who lived in this Parish 60 years, deservedly respected, and after a painful Affliction died 23rd March 1806 in the 80th year of his Age and also of Jane Whimper, daughter of the above who died 25th April 1814 aged 60.' Richard's will was finally proved in 1810, perhaps delayed by his numerous codicils - five in all. At the end of the 18th century there were only four children surviving, Jane Whimper, Mary Oldham, Searles Wood and John Wood. Richard left the house where he lived in Melton to his son John. The property in Melton comprised "all that my Messuage or Tenement wherein I now dwell together with the Cottage Lands & Heredits to the same belonging in my own Occupation in Melton aforesaid with their & every of their Appurtenances." What was involved becomes clearer when he adds later, "Also I give and bequeath unto my said Son John Wood... my two desks with all my Law Books Precedents Blanks and other Papers relating to the Law in my Office." To Searles Richard left a house in Woodbridge, "all that my Messuage or Tenement Yards Gardens and Heredits in that Well Street in Woodbridge in the said County of Suffolk with their Appurts and now in the tenure of Mrs Sarah Mortlock". Well St is now called Seckford St. Perhaps this was where the family lived earlier and where the first three children were born as their christenings suggest that they moved from Woodbridge to Melton about 1757-8. It is not quite clear whether Richard's office was in Melton or Woodbridge. Perhaps he even had an office in both places. He refers to "my own Occupation in Melton" but in 1796 he is recorded as a churchwarden in Melton along with John Syer, 'Doctor in Physic' who was also a witness to his will. A document in the parish records concerns the lease of a piece of land called Melton Green Field which they granted to the parish clerk, John Freeland, for eleven years. (Suffolk Record Office, Ipswich Branch, Catalogue Ref. No FC 30/E2). Further evidence (FC104/LI/7) from Pettistree Parish shows more of Richard's legal work in connection with church charities. (Listed online in A2A documents). His youngest son John is recorded as 'John Wood of Woodbridge, gent.' in connection with a lease in September 1818. and by 1823 had an office in Woodbridge as 'John Wood & Son, Attorney', listed in Pigot's Directory. Although Searles had been left the 'house in Woodbridge' this is not necessarily the same as the office. By the time Richard died in 1810 John was already about 44 and must have been practising for many years. Perhaps the family business still continued as 'Richard Wood & Son' having begun with the two Richards but now with John as junior partner maintaining the Woodbridge office on his own. Both properties - in Melton and Woodbridge - were to be held on certain conditions. Within six months of Richard's death John was obliged to pay £1000 and Searles £300 "into my Residuum and go and be disposed of as I shall hereinafter direct," and in the event of failure to do so the properties were to be sold for the best price and the money to go into his 'Residuum' instead. Richard directed also that £500 was to put out "at Interest" for the maintenance of Jane for life, or for her children if she died, Searles was to receive £200, and John £300. He left his maid servant five guineas, his servant boy 2 guineas and then the rest of his belongings were to be divided between his sons Searles and John and his daughter Mary Oldham - when any outstanding debts of theirs to him had been paid. John was also given the task of continuing to 'hire' land from a Mrs Hook "paying the rent and performing the Covenants entered into by me" until they completed the due "remainder of the time and term." The will was not proved until 1810 but Searles had already made a will disposing of the property in Woodbridge as he must have known of this inheritance many years before. An unknown Elizabeth Woods m John Fulcher on 2 Feb 1734 in Melton. Fulchers appear in numbers of documents associated with the solicitors so there could be a connection here in spite of the spelling 'Woods' rather than 'Wood'. 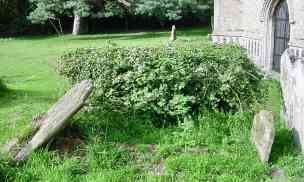 The name Fulcher also appears near the family graves in Melton Old Churchyard. 4. Mary Wood married Joseph Oldham on 14 Jan 1779 in Melton, SFK. all belonging to the Wood or Oldham families and grouped alongside the main family graves. The side wall of the church can be seen on the left. 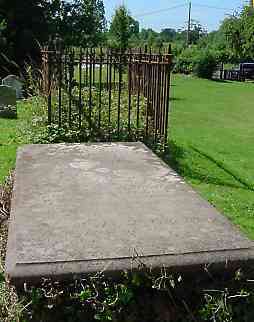 On the left, end to end with the Vault, is the 'unknown' grave pictured in full below. The large stone at the back on the right is that of Daniel Johnston and of Elizabeth Johnston, wife of Richard Wood Oldham. 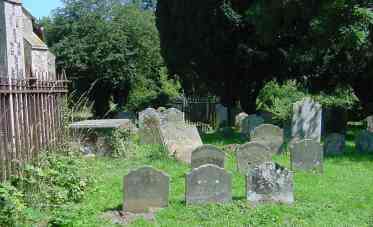 Seen above are the top two rows indicated in the table on the right with larger stones beyond but, as can be seen, not 'lined up' exactly. 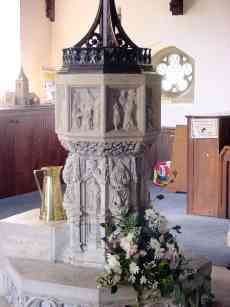 On the right the four stones beyond the cross (which is not a family grave) are those of the bottom row in the table above. The one on the right, appears to be inscribed J.O 1818-1828 . Further back another similar one has only the O. legible.The names of many others in the churchyard were only given as initials which seems to have been common practice for babies (but O presumably for Oldham) without any other details. The stone leaning over in the main photo above was not legible but from its position must be 'family'. See other photos (1 & 3)above to distinguish the small stone in front of it (Both are illegible). This grave, next to Richard & Mary Wood's is like that of Joseph & Mary Oldham - it is ridge-shaped and also built of bricks..
Only the first three on the left of the four stones see here behind the cross (those in the bottom row of the table) are easily identifiable, all children of John Wood junr., nephew of Mary who married Joseph Oldham (see the partial family tree above and also the later Wood family page showing others in this branch of the family) . .Probably the rows indicate generations, the top row being the oldest. The John in that row could be John Oldham 1784-1785. Joseph Wood Oldham is a new puzzle as Joseph and Mary had a son Joseph who lived 1786-1858 as well as a William, 1790-1879. Joseph, born about 1801, is very unlikely to be the son of Joseph Oldham, nor was he the son of Richard Wood Oldham who did not marry Elizabeth Johnston until 1810, but presumably he had ancestors from both families..... Was there another Oldham son who married one of the Wood family? A 'double marriage' like this - two of one family marrying two of another - is not uncommon. A guess is that the children in the second row are those of John Wood and Mary Baker, hence the addition of 'Caroline Wood' (legible on the original copy of this photo) to their list of children in this account, though there is no other evidence for this. 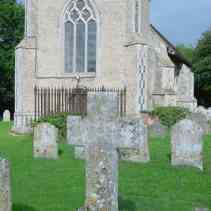 The grave on the right beyond Richard Wood's is that of Mary's brother, John Wood senior and his wife Mary Ann. The inscription is listed in full on the next page.